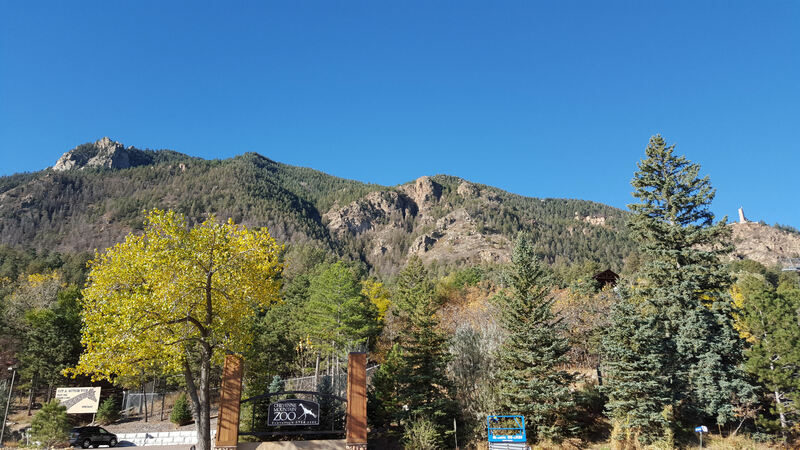 The Springs in Fall — 2015 Photos #10: Nature Near NORAD « Midlife Crisis Crossover! Fans of Dr. Strangelove, Stargate SG-1, WarGames, and numerous other near-apocalyptic dramas may recognize the location. No, I don’t mean the zoo. 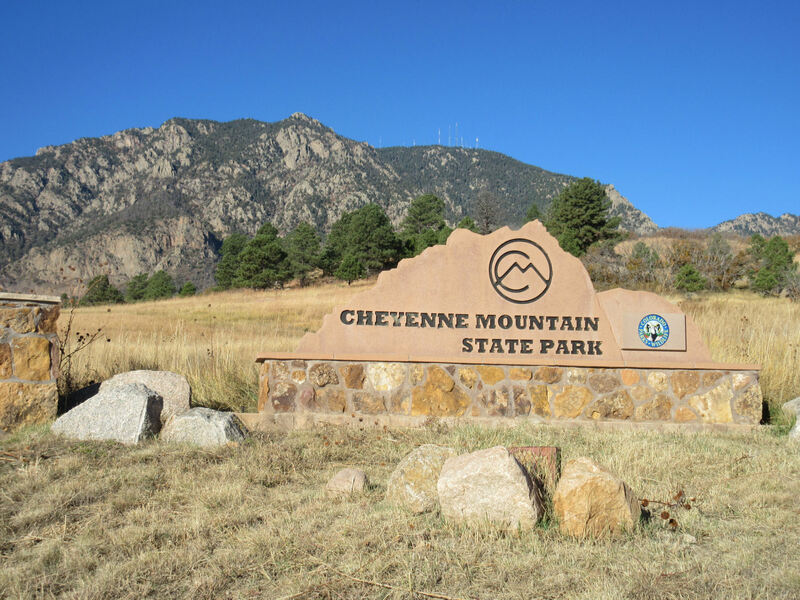 Welcome to Cheyenne Mountain! 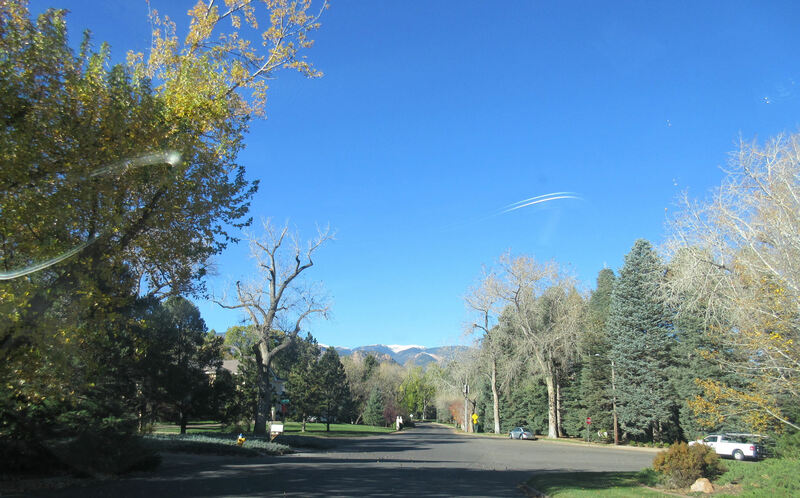 One of the most distinctive sections of the Rocky Mountains in the Colorado Springs area, this mass was once home base for the North American Aerospace Defense Command. If you saw a movie or TV show in the ’80s or ’90s in which grouchy American military officials glowered at each other in a secret underground bunker and tossed around terms like “mutually assured destruction” or “DEFCON 1” or “the football” or “Russkies”, chances are they were filmed in a sterile Hollywood soundstage but fronted by a stock photo of thick, beautiful Cheyenne Mountain. NORAD isn’t quite the hotbed of top-secret nuclear management it once was, having transferred its primary functions to nearby Peterson Air Force Base. (No public tours. I checked.) Today it’s a mountain with a lot going on around its base, not much of it related to national security anymore. The morning of Day Three, I left our hotel for the south end of town, forgetting it was still early in Colorado Springs and not much was open yet. 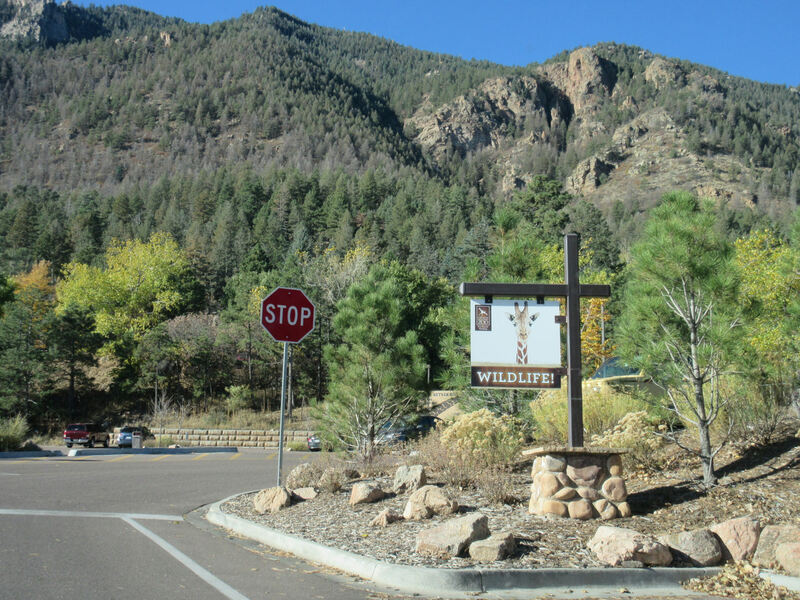 Plan A was a walk around Cheyenne Mountain State Park, but I arrived well before the Visitors Center and the main gate were ready for me. My fault. I figured I’d come back later. But the mountain view is open 24/7. They haven’t invented gates large enough to throw in front of those peaks. Unfortunately that stretch of highway doesn’t offer time-killing options to civilians. A few exits lead to Fort Carson and other military bases with foreboding signs cautioning those ramps are for authorized personnel only. Not so many opportunities for wandering the land and getting a feel for the Springs ’round those parts, where the preeminent vibe is “DO NOT ENTER”. The lack of options inspired me to take care of one minor housekeeping errand. Our Estes Park 12-pack of bottled water was nearly gone. I wasted several minutes combing through the packaged-water options at one grocery and lamenting how many of them insisted sodium positively should be an integral part of the natural drinking water experience. I spent too much on one 24-pack of actual water later and headed off into the upscale neighborhoods surrounding the mountain. Photographing while driving is easy when no one else is awake and you can slow down to 15 mph without fear of anyone tailgating you. Even before I reached my next stop, animals were already making their presence known, doing their part to spiff up the ambiance and reinforce Colorado’s reputation as a land teeming with life, nature, and adorable critters. The deer and I each agreed the other was too harmless to confront. 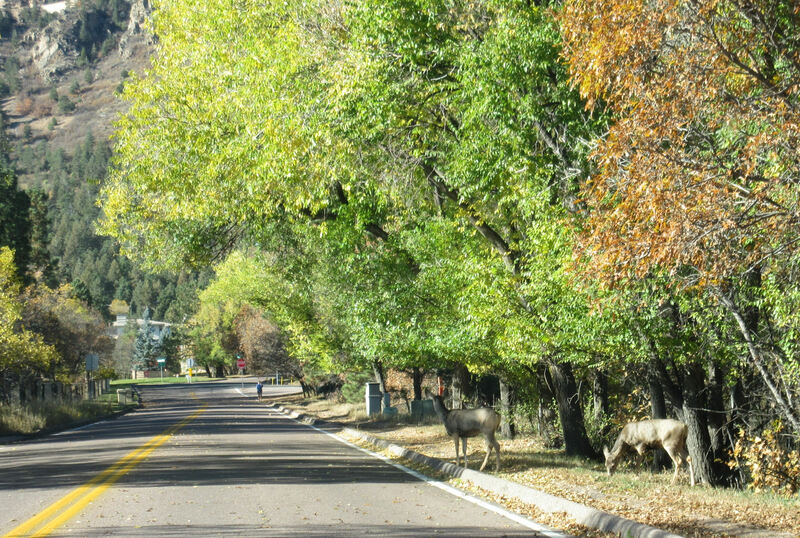 Speaking of critters: these winding residential roads led me to the fabulous Cheyenne Mountain Zoo. Kind of a weird place for a fortysomething guy to hang out alone, but I had an idea. 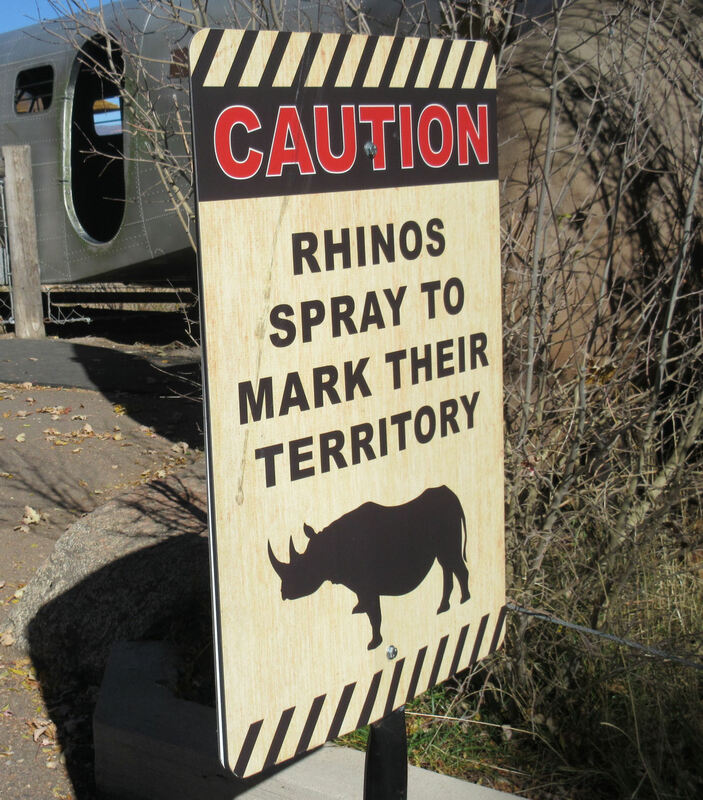 “WILDLIFE!” was the last in a Burma Shave-style series of signs along the path, but it was the word that counted most. In our early road trips we would stop at zoos as a concession to my son, who needed some sightseeing geared toward his level and thankfully loved animals. Over the years we’ve seen zoos of varying quality in San Antonio, Atlanta, Minnesota, Canada, and the Virginia backwoods largely for his sake. 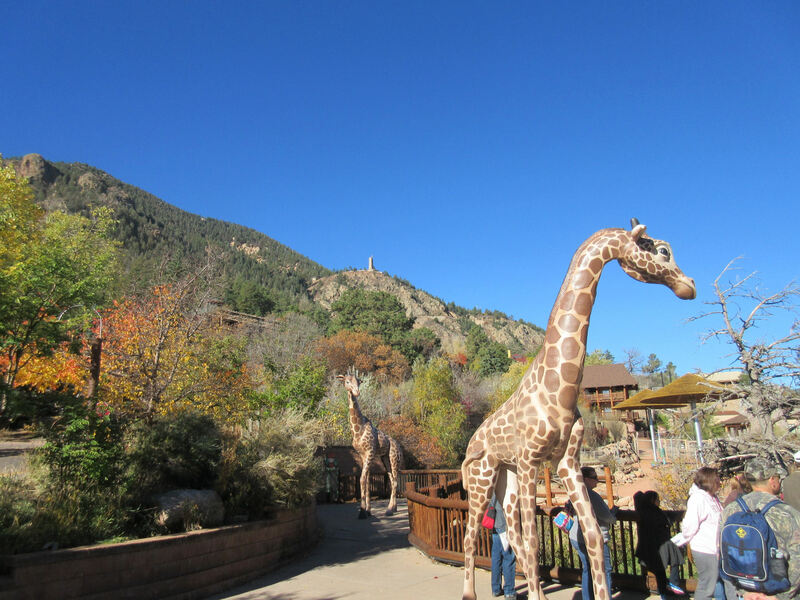 So here in Colorado Springs I wondered to myself how it would feel to stroll through a zoo at my own pace, see the animals that look most interesting to me, linger at whichever enclosures I feel like lingering, and see how it feels to focus on the zoo animals instead of a distracting child. 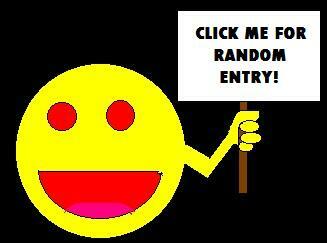 It sounded like an interesting experiment. Worst-case scenario, I get bored and leave after an hour, but the zoo gets to keep my admission fare as an easy donation. So why not. Fake giraffes are among the photogenic decor choices you can use in case the real animals are busy on lunch break or calling their agents or whatever. To my delight I found boredom wasn’t a problem. ‘Twas a fascinating place, structurally as well as zoologically. Plenty to see beyond just the animals, though those were in healthy supply. 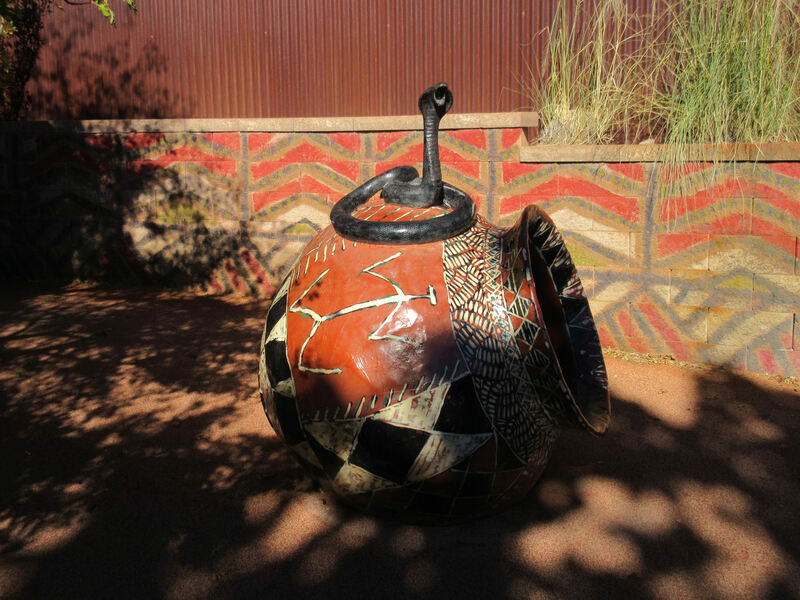 Fake cobra gets his own giant pottery. Pretend he’s alive and vicious and approach him doing your best Rikki-Tikki-Tavi noises. 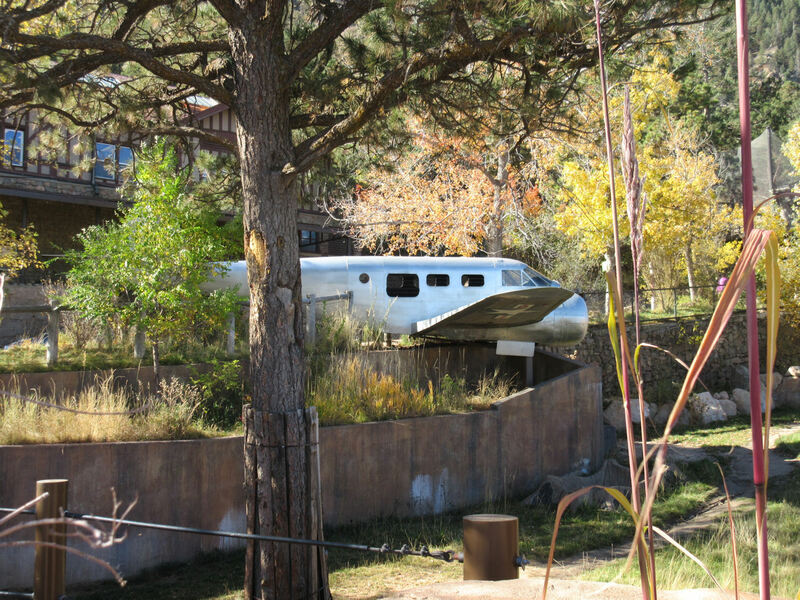 If your kid needs a break from Wild Kingdom, this tiny abandoned aircraft is a fun imagination station where they can sit in the cockpit and pretend they just crashed in Africa or on Isla Sorna. I did make a point of trying not to act like a creepy loner around the other patrons. It wasn’t crowded, but a fair number of housewives and kids were the ubiquitous target demographics on the scene even in November, some of whom were local home-school groups on field trips. I put on my customer-service happy face, held doors where appropriate, stood out of the way so kids had first dibs on animal viewing, and fielded random comments from the occasional happy-go-lucky tykes dying to talk to anyone in reach about the totally awesome lifeforms that were blowing their minds. Because sometimes people need practical advice. 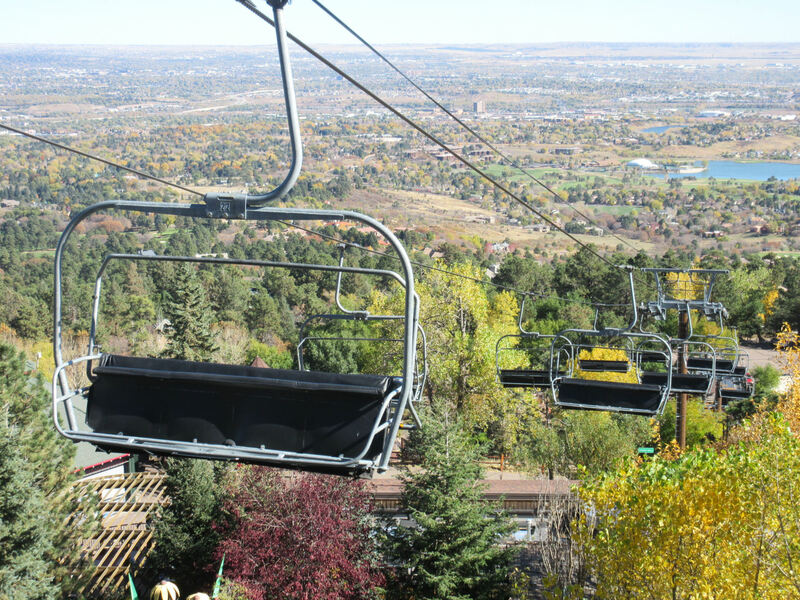 Most amenities were closed for the season — snack shops, surplus souvenir stands, and the Mountaineer Sky Ride, a chairlift that takes passengers up and down the length of Cheyenne Mountain for as far as the zoo’s property stretches upward. A couple of tower staircases offer the same viewpoint, but not the chance to kick your feet back and forth in midair while you’re living large like a real Colorado skier. Note the view away from the mountain, out across Colorado Springs. A ride in either direction would be worth the money if it were turned on. The most brilliant aspect of the zoo is how the layout guides you in a specific route beginning with the lowest levels, then nudging you upward one level at a time, letting you gander at the beasts on your level first before you turn around and look down upon those you just saw on the previous level now below you. Multiple vantage points for dozens of denizens basically gives you twice the visual intake for your money. Dat view, tho. And yes, those are some of the real giraffes hanging around. And all that was just the surroundings. We’ll get to the animals next, including the ones I shared a pen with for a few minutes. None of them were five-star generals, but in my book they’re pretty okay anyway. I’m very proud of our beautiful zoo! 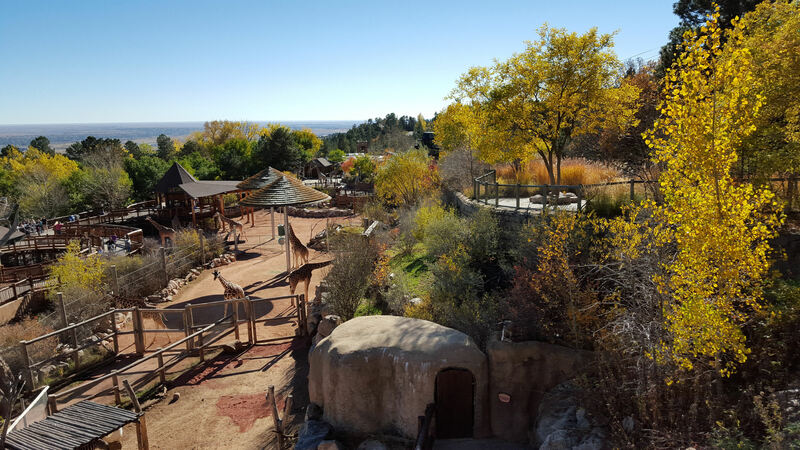 It’s award-winning and one of the very few US zoos that are entirely privately funded. I read about that. It’s an impressive feat, and easily one of the neatest zoos I’ve ever seen.